SOMERVILLE –The Somerville Public Library invites all members of the community to participate in the 2018 Summer Reading Program, running from June 19 to August 15. 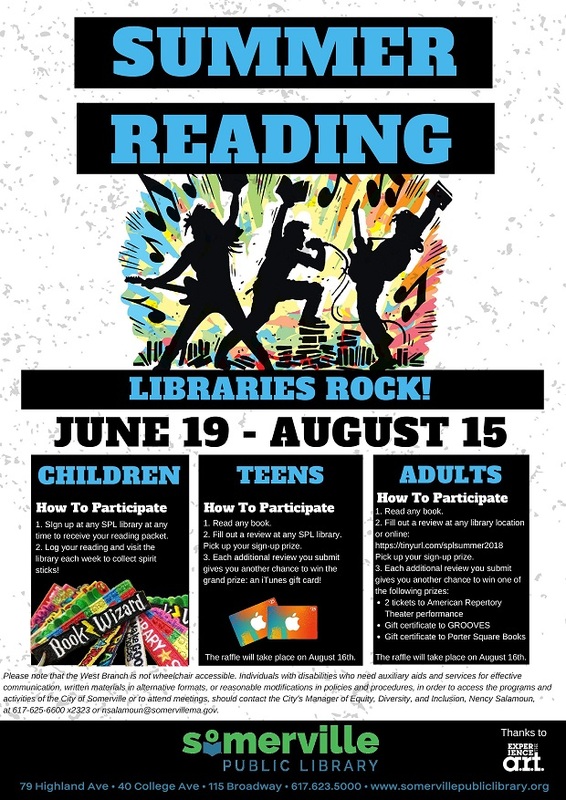 All three library locations will be offering a variety of programs and prizes around this year’s national Collaborative Summer Reading Program theme, Libraries Rock!™. For the second year in a row, the Somerville Public Library will be offering programs for readers of all ages, including children, teens, and adults. Multilingual Concert with Sulinha:Sing, dance, and drum along at this interactive concert that mixes familiar songs with Brazilian rhythms and melodies! Upon registration each child will receive a packet with a reading log and other prizes. Children are encouraged to log their reading and check in weekly at the library throughout the summer to receive prizes. New this year, each child who registers is automatically entered into our Ice Cream Social with the Mayor contest. At the end of the summer, four children and their families will be invited to share ice cream with Mayor Curtatone and the other winners. For more information about the Summer Reading Program, please call (617) 623-5000 or e-mail sommail1@minlib.net.